The cause of the politicians’ concern was the announcement by the Californian bank, Merchant’s Bank, that it was closing the accounts of Money Service Businesses (MSBs) that handled transfers to Somalia. The result, said the politicians, citing Oxfam, was the loss of the greater part of US$215 million that was sent in 2014 from the United States to Somalia, “most of which was used to meet basic humanitarian needs”, according to the letter’s signatories. The plea from the members of Congress (most of whom represent districts or states with notable Somali communities) highlights the dilemma faced by financial institutions when handling transactions involving unstable countries. As highlighted recently when Mondato Insight examined the plight of Colorado’s entrepreneurial horticulturists, the penalties for financial institutions for running foul of anti-money laundering / countering the financing of terrorism (AML/CFT) laws and regulations can be huge. Traditionally an industry known for risk-aversion and erring on the side of caution, most banks have come to view dealing with Somalia as being simply too risky. Over the course of the past several years, the noose has slowly been tightening around remittance corridors from wealthy countries such as the UK, Australia and the United States to Somalia. In late 2012 HSBC was fined an eye-watering US$1.9 billion for failing to implement an effective program against money laundering, and also failing to conduct adequate or any due diligence on some account holders. Some six months later, Barclays announced the closure of the accounts of all MTOs in the UK that dealt with Somalia, as discussed by Mondato Insight at the time, (though it was later ordered by a court to stay the closures). It is the latter requirement from the Treasury’s Comptroller of Currency that is causing difficulties for the money service businesses. The authority of Somalia’s federal government does not extend much beyond the capital, Mogadishu, and the country has no central bank. This has created something of a Catch-22 in the country, where the total value of remittances is greater than foreign aid and foreign direct investment combined. Any significant reduction in remittance flows could further weaken the capacity of the Somali federal government to carry out those very activities that would satisfy U.S. banks and their regulators. It is the long shadow of Al-Shabaab, the Somali-based militant Islamic terrorist organization, that darkens the doors of U.S. banks who facilitate money transfers to Somalia. Responsible for attacks not just in Somalia, but also in neighboring countries, it is reported to have an annual income of some US$100 million per year, in part gathered through the extortion of money transfer businesses. What frustrates many of those in the Somali remittance business, as well as those who have families in Somalia dependent on remittances, is that no Somali MTO/MSB has ever been charged, let alone convicted, of money laundering or financing terrorism by U.S. authorities. And while a Minnesota man was charged with sending $8,500 to fund Al-Shabaab, he continues to vehemently deny the allegation, going so far as to say that he “despises” the organization. When Barclays announced it was shuttering the majority of MTOs in Somalia that relied upon it to function, court action and government intervention forced a delay in the move, in order to give the remittance businesses time to reorganize their affairs and make alternative arrangements. No similar action has been taken in the United States, despite an outcry from the Somali community and aid organizations. Activists and NGOs point out that 16% of the total that Somalia receives from its diaspora originates in the USA, and some fear that the shutting of the tap will have devastating economic consequences for the already impoverished nation. Moreover, when interviewed, many members of the Somali diaspora expressed concern that were remittances to dry up, young men could be attracted to drink at the well of extremism, attracted by a US$50 conscription bonus. A State Department spokeswoman appeared to brush off such concerns, telling journalists that “It’s a bit of a stretch to draw [economic opportunity] directly to remittances”. Whether such concerns are overblown remains to be seen, however it is worth noting that since Mondato Insight last covered the issue more than 18 months ago, concerns that were expressed at that time appear to have been largely unfounded, and the Somali diaspora has found alternative means, largely within the parameters of “traditional finance” to ensure the funds keep flowing. Their options for working though traditional financial institutions continue to narrow, however, and it is entirely possible that the will soon run out of options. 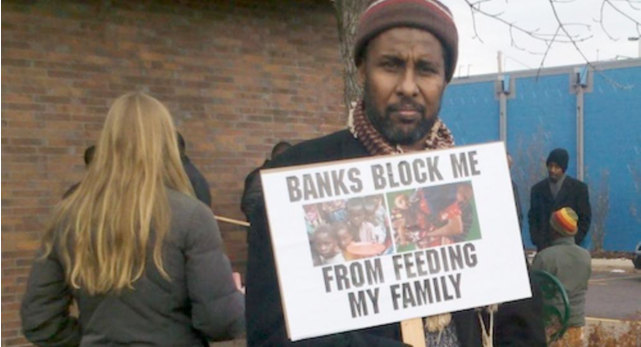 What is significant about the plight of Somalians who are finding it increasingly difficult to fund their families back home, is that in many respects it mirrors that of cannabis growers in states where it is legal, but who still run foul of federal banking authorities and as such are personae non gratae for financial authorities. The U.S.-Somalia remittance corridor is ripe for disruption, yet no significant challenger has emerged to replace the bank-based system that has dominated. Bitcoin remains in an uncertain condition, too new and untested a technology to satisfy the needs and concerns of impoverished Somalis and their families abroad (and, indeed, its use would somewhat defeat the regulators’ desire for transparency and accountability). Alternative value transfers, such as airtime (the subject of previous Mondato Insights) have not taken off, while international mobile money transfers do not yet exist. A 2013 report into remittances in Somalia claims this is in part because Al-Shabaab has threatened MNOs from allowing the practice. It is this last point that highlights the potential that mobile money has in circumstances like this. Within an appropriate regulatory framework, international mobile money remittances offer a traceable, safe and secure means of transmitting money (or value) to the families abroad who need it. And it is precisely this fact, and the reduced capacity for extortion by terrorists, that leads them to oppose it. All of which goes to demonstrate that when criminal intent and regulatory vigor come into conflict, disruptive technologies may have little role to play. As is often the case, it all comes down to politics.